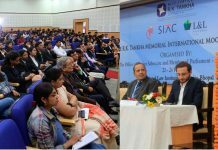 Chhindwara: In what comes as a historic day for Chhindwara centre of Apparel Training & Design Centre (ATDC), when Hon’ble President of India, Sri Pranab Mukherjee, graced the campus with his august presence on December 14, 2016. The President and other dignitaries, including Madhya Pradesh Governor Sri Om Prakash Kohli were received by Hari Kapoor (Sr.Vice Chairman, ATDC), G S Madan (Vice Chairman, ATDC) and Dr Darlie Koshy (DG&CEO, ATDC & IAM) there. Hon’ble President who was given a tour of “Mission to Movement” display by ATDC and first-hand detailed demonstration of each and every work station including the Cutting machines, the computerized sewing machines, the pattern making room etc. at the centre. The president also interacted with the SMART Sewing Machine Operator course students under ISDS, MOT and also the new B. Voc courses candidates at the Integrated Campus. Rashtrapati Ji appreciated the infrastructure and quality of training at ATDC as the trainers focus on providing maximum hands-on technical skills through practical approach in simulated factory like training infrastructure of ATDC, supported by factory visits and internships. 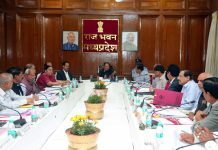 The ATDC is committed towards the Skill India Mission dedicated to apparel sector and is doing its best to spread technology and skills as the largest Vocational Training Provider for the sector in order to provide skilled professional workforce to the nation to improve productivity and efficiency for long-term competitiveness. ATDC has emerged as the largest Vocational Training Provider for the textile-apparel-chain offering a comprehensive bouquet of courses for career progression in an integrated manner by creating a step ladder – training eco – system with clear focus on skilling of aspirational Indian youth for the rapidly growing export-domestic apparel sectors.